Another picture from my excursion into a damp and foggy world (a rarity of late here in SoCal where temperatures have been heinously high). This time, a panorama of about 9 images, cropped and edited a bit. I used the Df and 24-85 lens. That morning, the fog was very thick, and even around 9:30 a.m. when I took this, the fog was dense. Only later did the sun break through. It was rather eerie to wander alone . . . just a few days from Halloween! 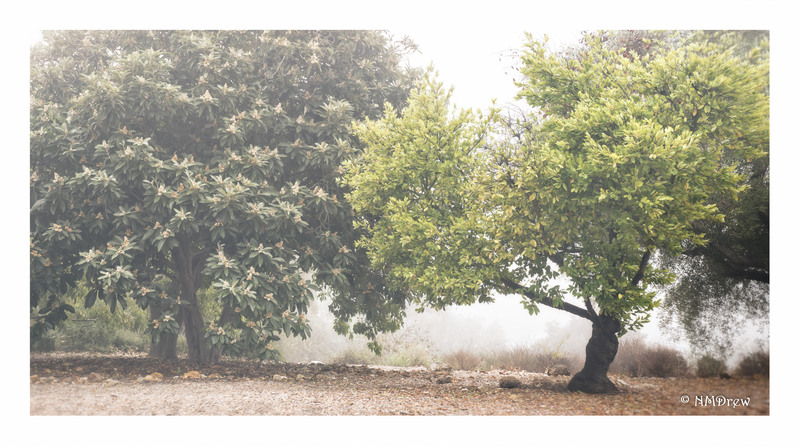 This entry was posted in Glimpses and tagged botanical garden, fog, hilltop, Nikon 24-85mm 2.8-4, Nikon Df, panorama, photography, trees. Bookmark the permalink. Cool, can’t tell it’s a pano, am thinking the trees must be bigger than they look! I had a 60mm macro with me, so had to work with what I had.